Alabama Gov. 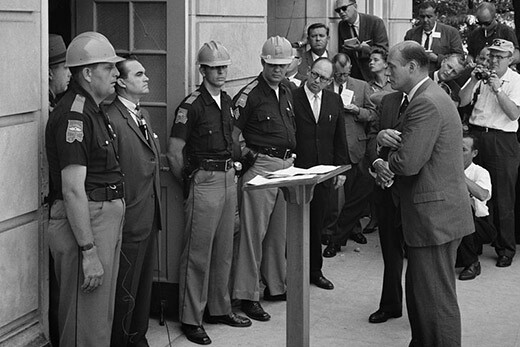 George Wallace attempts to block integration at the University of Alabama on June 11, 1963. Wallace's political career is one of the topics students in History 385 will explore in Wednesday's "Documenting the Right" film festival. Public domain image by Warren K. Leffler, U.S. News & World Report Magazine collection at the Library of Congress. Emory College undergraduates in an upper-level history class are analyzing U.S. political movements by learning about digital storytelling and multimedia production through projects that tap the expertise of the Emory Center for Digital Scholarship (ECDS). The syllabus for the “History 385: Right-Wing America” class features an assignment to produce brief documentary films that can help viewers better understand an individual, group, incident, debate, or controversy in American history. The resulting set of short videos will be shown at a public screening on campus on Wednesday, Nov. 29. The "Documenting the Right" Student Film Festival is set for 7 p.m. in White Hall, Room 111. Steve Bransford, ECDS senior video producer, coached students with video production and consulted with Crespino and his teaching assistant, Laney Graduate School student Virgo Morrison, on related classroom instruction. Students, encouraged to select subjects with compelling visual and audio material, have been able to seek out resources from distinctive Emory collections in Southern history, modern politics and African American history. Multimedia production helps students learn how to think critically in new ways and to contribute to public scholarship by reaching a broader audience through their studies. The “Documenting the Right” Student Film Festival promises to feature a range of topics that include racism in the political career of George Wallace, white supremacy in Forsyth County, and Atlanta’s “city too busy to hate” slogan. The student films will be evaluated by a panel that includes Crespino, Bransford, Bruchko and Morrison.